VITA B Cream - pHformula | Aspire & Co Ltd.
Vitamin B3 is essential to prevent and reverse visible signs of redness, pigment changes and skin ageing. 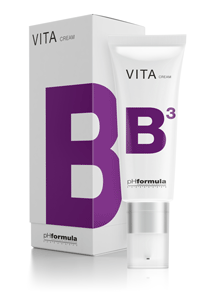 pHformula has developed a highly concentrated vitamin B3 cream with 24 hour moisturizing properties to offer immediate and intense hydration. The light textured Vitamin B3 cream contains Niacinamide at prescription strength, which result in superior skin correction benefits, ideal for daily and year-long application. The 24-hour moisturizing complex in the formula comprised of a synergistic blend of natural moisturizing factors to assist in pro-longed hydration and protection of the skin. Available in 50ml or 20ml.